On April 10, 2009, Costarrican Dr. Rafael Lamas was taking some pictures and in one of them appeared something he didn’t even see when making the snapshots. It was later, on his PC when he realized that there was something apparently strange. 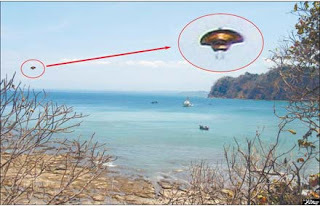 An enhancement of the “object” revealed a particular shape and color, and it was initially classified by Costarrican Ufologists as a U.F.O., but they were intelligently cautious as not to speculate and to demand an analysis of the picture. Finally, an analysis was made by Prof. Ana Luisa Cid who came to the conclusion that the U.F.O. was really a butterfly of the Adelpha Cytherea Marcia type, abundant in the Central American country. We came to know this case thanks to the contribution of our member Mr.Gonzalo Piano.